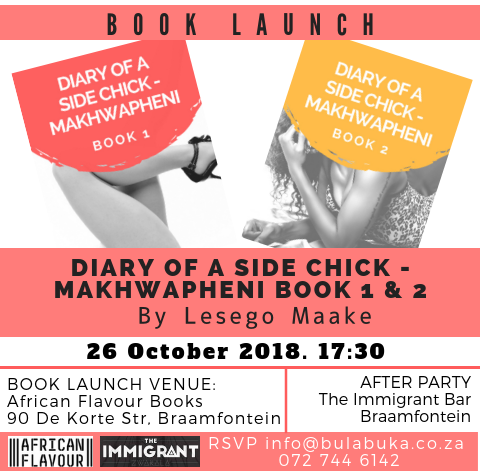 African Flavour Books, Egavas Media and Bula Buka invite you to the launch celebration of ‘Diary of a Side Chick – Makhwapheni’, book 1 and 2, by Lesego Maake. The book launch takes place on 26 October 2018 (Friday) at African Flavour Books in Bramfontein-Johannesburg. Arrival time is 17:30. To RSVP, send an email to info@bulabuka.co.za. Over drinks and snacks, come and be part of an exciting conversation led by Lunga Ncala of how Lesego Maake – a male – began writing about a ‘side chick’ series that now has fans across the world. This new book series started out a blog series in 2014 and was viewed over a hundred million times. It has amassed fans in South Africa, Kenya, Zambia, Zimbabwe, Namibia, United Kingdom, Lesotho and the USA. ‘Diary of a Side Chick Makhwapheni’ takes us through a life journey of Limpopo-born Sharon Letsoalo. Besides dating and sleeping with men of other women, the wind of the city forces Sharon’s life to often sail close to danger. To RSVP and book the seat, make payment for one or more books into the bank account at the below. Email the proof of payment to info@bulabuka.co.za. Each book costs R220 and a bundle of the two books is discounted to R400. SEATS ARE LIMITED. Bank account: Bank – FNB, bank account – 62727957047; branch code – 255005; account name – Ubuntu Royal Capital (Pty) Ltd; reference – cellphone number. Please invite a friend or bring a partner. African Flavour Books is located in Braamfontein on 90 De Korte Str. An after party will be held at The Immigrant Bar right across African Flavour Books from 8 p.m.
Lesego Lucky Maake was born in Ga-Kgapane outside Tzaneen in 1985. He is the first of three children. He developed his love for reading and writing while in primary school. Lesego has written other blog stories that have amassed millions in views: My Rich Nigerian Boo, Marriage on the Rox, and, Chronicles of a Playa – Rhulani Chauke.